Please note, that due to the new monthly Newsletter, information is now available on that section of this site. We're home, after 4 weeks in Ukraine! We had a great time, though there are always a few glitches, i.e., no water, bad weather, etc. A very big thank you to all of you who prayed for us in our absence, we serve a great and powerful God, and your prayers were answered! We departed on June 14th, and arrived after a few connections in Kiev. Rained for the next 4 days. We stayed in Kiev and saw the sights (St. Michael's, St. Andrews, St. Sophia's went to the Museum Under the Open Sky which is the largest mus. in the world, and the kids got to ride the metro several times, and shop for souvenirs), between rain drops, then on to the Crimea, where we visited an orphanage there, and made a list of various needs. I have been told that there is an American woman helping this orphanage, but after seeing this place with my eyes, I have some very serious doubts that the money she is collecting is getting to this orphanage. Sad, but true. The next day we on to Yalta and the Black Sea. Though the weather was NOT cooperating, all was fine, and Yalta is very nice. The next day, we were on to Sevestapol, seeing the sights. Went to some place where treaty was signed with Roosevelt and Churchill, Rich, the history buff enjoyed that. On June 22 we headed for Mariupol to Artur's orphanage. We rented a van to take us there, and though a long trip (9 hrs.) we got to 'see' Ukraine. Artur was able to visit with 'his friends' (as he calls them), the orphanage director and his caregivers. It was a tearful reunion and departure. We took several photos. Then we were off to the village of our friends, and arrived very late and exhausted!On the 23rd. the rest of the mission team arrived. There were 19 of us in all. We all got acquainted, and worship on Sunday was a blessing. It was great to see everyone again, and many new faces! I think we had about 70 people there. Seating is a problem, as there is not enough room anywhere to seat that many people, thus we sat under the grape vines at the minister's house, which was so beautiful, and the weather was good. Monday started VBS, and all was ready. The college students from Valdosta did a good job, and so did Judy from Tallahassee. All was a success, and I think we had 137 in attendance. Each evening we had Bible classes, which Bill taught the men and I taught the ladies. We worked on 'having Godly' relationships, and being Imitators of God, Eph. 5:1. We went to the orphanage on Wed., Thursday (2x), and it was great to see the director and she graciously accepted our gifts of medicine, shoes, and clothing. We made a list of some of her needs, and hope to collect some funds to purchase these items. One thing, the director came to church, which was great! And then she came for a visit on the day we left. This is the first time she has ever done this, and we are prayerful that she will continue to come to church. Her mother had just passed away, and when she heard that we were in the village, she made a special trip back to see and visit with us. We took the bus, on Sunday, to the city for the singing school, which started Monday. We met with 5 more Americans which conduct the singing school. There were about 120 people there to learn, and then the team from America, about 19. Monday after the first day of the school, I could plainly see, that my kids were not going to 'make it.' Classes were long, and 'over their heads'. Thus I went and got the necessary permission to go to orphanages to visit. I contacted the local missionaries, Lynn and Linette from Memphis (these ladies were such a blessing and servants to us in many ways), and they gladly agreed to set up the appts. and travel with us. Thus, Wed., Thurs. and Friday that is what we did, going to orphanages and orphan children's hospitals accessing needs and making lists. We have decided that it is probably best to purchase the items in Ukraine, vrs. trying to take items there. The U.S. $$ goes a VERY long way there, and our purchases will help generate their economy. If any would like this list of items and the specific costs (purchasing them in Ukraine), I would be happy to forward it. My plan is to return in the fall with funds to make these purchases and to hand deliver them. I will NOT just send or give money to directors of the orphanages. The 2 greatest needs seemed to be in the orphan hospital and a shelter for kids in-between street and orphanage. The hospital was deplorable, and the children lay on plastic mats in leotards and tee shirts. Not toy, one. They were starving for affection, and 'something' to do. We decided that crib mobiles, toys, diapers (they had none! ), and walkers, and various medicines were going to be most helpful, and the staff fully agreed. The shelter had children 3 – 18 (too big a group), but they were in terrible need of clothing and shoes, and 'something' for the kids to do. But I must tell you that it was a blessing that we were able to see and photograph the children. The directors were VERY humble and gracious it our offer to help, and gladly welcomed us. 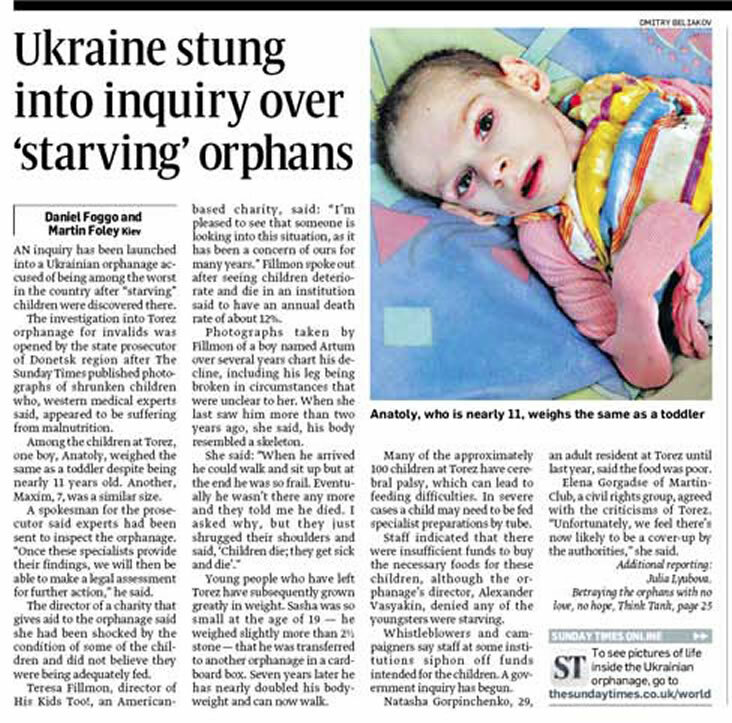 In Ukraine, things could have been very different, but again, God was working on their hearts, and they knew we genuinely want to help these kids. Well, our trip concluded with our return to Kiev and more sight-seeing. Our group was still 13 large, and many of them wanted to see the sights. I got terribly ill on Sunday, and was 'out' for 2 days. Tuesday we left for Paris, and stayed the night there (if you are ever going there, drop me a note and I'll be happy to forward you some information). Wed. a.m. we took a great bus tour and saw the sights, and then we were off to Atlanta. We arrived back at 11:45 p.m. after a very long day! Thank you again to all who prayed for us, and donated funds for our trip. It was truly a blessing, and we can see God working in several areas in Ukraine. If you have any questions or comments, or would like the list I mentioned, please drop me a note, as any support will go directly to the children, not for any of our expenses.